After all Evan's been through in recent years it would be foolish to expect him come back with an album to place next to "It's A Shame About Ray" or "Come On Feel the Lemonheads", but surely after rumours of an album for the past 18 months we expected something a little more complete than this. "Baby I'm Bored" is an album which hints at greatness, but never quite delivers on what can only be described as a collection of demos and the very fact that they dare to put the names of Bryce Goggin and Jon Brion on the Production Credits is wishful thinking rather a accurate description. "It Looks Like You" is one of the few tracks which takes you back to the glory days of the Lemonheads circa 1993 with it's country tinged bliss and harmonies. Surely one of the best songs Dando has ever recorded to date and if the rest of "Baby I'm Bored" sounded like this then he would be thrust back into bona-fide heartthrob superstar status within the week. You get the sense that after his much reported problems, which resulted in him following Oasis around like a lost puppy for months, that he would rather gently ease himself into things again to ensure he doesn't fall back into his old ways. "I can't believe how far I slipped, but I'm secretly glad I did" he admits on the autobiographical "The Same Thing" which charts his downfall and maybe he has to get this out of his system before he can move on to the next record. "All My Life" is a song which has you on the brink of tears every time and you can genuinely see why Evan has called this the best album he's ever done. While on a more uplifting tip "Waking Up" is charmingly naive and actually is improved by the lo-fi recording. Maybe the genuine reason why the album is a such a raw recording is that it's designed to attract those people who look at music on a deeper level rather than the superficialities of a teen magazine cover. 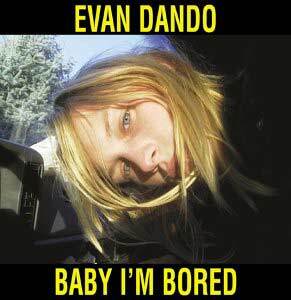 Given time "Baby I'm Bored" is an album which pulls on the heart strings and lyrically it's an album that Evan has laboured over meticulously. It's just a shame that at times it's lets down by the ramshackle production, because if these songs sound this good in their current state imagine how good they'd sound if they were recorded properly.